Length: The Bear Trail itself, is a very easy walk about 1.5 miles long, one way. When one does it as a loop (walking through the COS campus) then it is about 2 miles in length. When to Hike: Typically it can be hiked from March through November. Otherwise,the Bear Trail is almost accessible year-round, except for the snowiest times of the year. Special Features: A nice short hike to stretch ones legs without having to drive too far. The relatively dense conifer forest provides a cool shady walk during the summer. Direction to Trailhead: From the Central Weed exit off of I-5, go south on the frontage road (South Weed Blvd) to Siskiyou Way and go west. As you come onto the campus, turn left and look for parking area C. The trail is marked by a sign and begins by the curve in the road to the left of the residence halls (Juniper Lodge). Also, you can catch the trail by driving approximately 0.6 miles west on College Avenue, past the campus entrance, to a gravel road on your left with a red gate. There is room to park, but don’t block the gate. The trail begins to the left of the gate about 50 yards with a sign post. 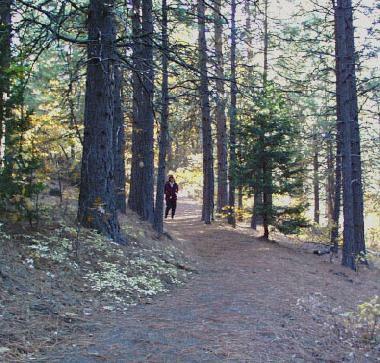 Description and Comments: The trail goes around the edge of the College of the Siskiyous campus, in a forested setting managed by the college (thinned and fuels reduced). While on the trail, one gets glimpses of campus facilities in places and hikes through the edge of a disc golf course.